Capable of great Full HD and acceptable 4K video, this budget shooter makes an argument for having a 'backup' action cam in your kit bag for risky shots. But it lacks a built-in tripod thread and native waterproofing. Sixty dollars (or pounds). That's how much Chinese company Yi is charging for its latest budget action camera. And you know what? It's pretty good. Yi has been on a mission to undercut GoPro for a while, issuing a few budget action cameras like the Yi 4K. However, now it's undercutting itself by taking its already good value Yi Lite and slashing a few features to create this new version, the Yi Discovery. 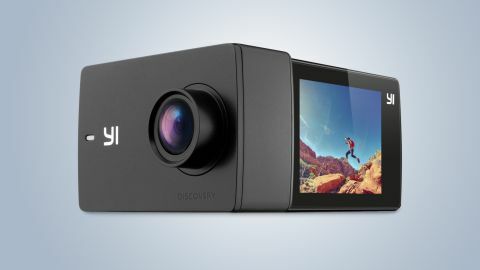 The accessory-laden Yi Discovery Action Camera with Accessory Kit bundle sells for £59.99 / $59.89, while the Yi Discovery Camera pack (which includes only the camera, a micro USB cable and a battery) sells for a mere £42.99. While the former package is aimed at the beginner, the latter is explicitly for the 'backup' action camera market. Don't want to hurt your GoPro on a particularly daring shot? So buy a standalone Yi Discovery and damn the consequences! It's a novel sales tactic, but at this low price, it might just work. This action camera does 4K. Considering its super-low price, that's remarkable, even if it is limited to 4K at 15/20 frames per second (fps) – 15fps for NTSC, 20fps for PAL. It also films in lesser video qualities to save space, namely 1440p/25 or 30fps, Full HD 1080p/60 or 50fps and HD 720p/90 of 75fps. It saves them as H.264/MP4 files. The sensor is unchanged; the Yi Discovery has a Sony MX179 image sensor capable of 8MP still photos (which it upscales to 16MP), and a 150° wide-angle, fixed focus lens with an aperture of f/2.4. Not so the rechargeable lithium battery, which is less impressive; just 900mAh compared to the Yi Lite's 1200 mAh. Still, there are two of them in the box. Yi promises 110 minutes battery life for Full HD 1080p, and 75 minutes if you shoot everything in 4K. The contents of the box is impressive. In the accessory kit we tested there was an underwater casing good for a 40m dive, two batteries, a chest strap, a suction mount, a bike handlebars mount, and loads more. The Yi Discovery also has a 2.4GHz Wi-Fi module. Not the 5GHz option on the Yi Lite, but no matter. The app that controls it remotely, and exchanges files with a phone, is unchanged; that Yi Action app links easily to a phone and transfers video and stills without fuss, though it does downscale 4K videos to Full HD when it sends them to a phone. It's then easy to upload footage to social media and YouTube from within the Yi Action app. The software on the Yi Discovery is exactly the same with all other models, too, so it includes advanced features like burst mode, a timer mode for group shots, slow-motion, time-lapse, and loop record. The Yi Discovery does not feel like the cheap purchase it is. The packaging is unfussy, but good quality, it's all packed well, and the product itself is almost exactly the same as other pricier Yi products. In a market saturated by cheap-looking products, the solid Yi Discovery is an exception. It uses almost exactly the same 65x42x30mm chassis as the Yi Lite, weighs an identical 72g, and has the same size LCD screen. In practice, there is a difference in the quality of the touchscreen, which is less sensitive, and sometimes jumps around during navigation. However, the biggest shame about the Yi Discovery's basic design is its lack of built-in tripod thread. That makes it impossible to mount on a tripod or selfie stick without first delving into that vast collection of accessories. For some users, that will be a major blow, as well the lack of native waterproofing. While on the Yi Lite there'a a sturdy battery cover that also includes a microSD card slot, on the Yi Discovery there's a far less substantial cover, with a 16-64GB microSD card slot and micro USB charging slot, situated on the side, and left open to the elements. Capable of smooth HD and acceptable 4K video, this budget Full HD action performs well beyond the 'backup cam’ claim. The Yi Discovery is not at its best when in 4K mode. The results are somewhat jumpy during camera pans and quick moving shots, which also include some jagged edges. However, the 20fps footage in our test displayed lots of detail in clean still shots. That’s not ideal for action footage, but at least colour is well saturated. So too on Full HD 1920x1080 video at 50fps, which nevertheless is still somewhat jumpy during pans, though has fewer video artefacts. There’s also a noticeable drop in detail. That goes double for video shot in 720p 1280x720 resolution at 75fps, though it’s smooth and easy to watch. If you’re looking for watchable video of action sports, 720p is the best setting. Frame-rates mean that Full HD 1920x1080 video at 50fps is the most efficient of the three, using-up less than half the space a 4K 20fps file occupies. A 720p 1280x720 resolution at 75fps video file is about a third smaller than 4K 20fps (though there’s a huge choice of frame rates for the lower resolutions). It’s worth mentioning that the Yi Discovery isn’t that great in low-light, so it’s best used in bright conditions. That also applies for photography, for which the Yi Discovery impresses. Its Sony IMX179 sensor actually takes eight megapixel photos and upscales them to 16 megapixels, and that’s obvious if you zoom-in on them. However, the color balance in some shots is excellent, and the wide-angle proved really useful during our test for taking photos of large, looming Georgian buildings of Edinburgh's new town. It’s a fixed focus fisheye lens, so vertical edges tend to bend and there is some chromatic aberration in the corners of the frame. It also pays keep your subjects at least a few metres away to allow for photo to be in focus. Where it doesn’t compare well to the Yi Lite is with boot-up speed and battery power; it’s slow to switch-on, and the battery only lasts about 90 minutes. So make sure you take that extra one along. The Yi Discovery is half the price of the Yi Lite, and less than a quarter that of a GoPro. For that saving you do lose features. There's no GPS, fewer frames are captured in 4K video mode, and nor is it natively waterproof. The battery is smaller, there's no image stabilization, and the chassis omits an integrated tripod thread. Nor is the touchscreen the greatest. However, if you do not care about any of that – and many won't – then the Yi Discovery is worth considering. It may not be the last word in action cameras, but it offers excellent quality stills and Full HD video, acceptable 4K if you keep the camera still, and an easy to use interface and app. The Yi Discovery proves a brilliant back-up and a thoroughly good value entry-level option for anyone after core features only, and at a price that's really hard to argue with.